My “tourist's guide book” mentioned of a gaol, or jail, that is the oldest surviving building in Fremantle City. The book also mentioned that this is the place where the time ball is dropped and a cannon fired at 1 PM every day. I am curious about the time ball. What does it look like? What is purpose of dropping it every day? Why is there a cannon? I imagined that the time ball is a sort of cannonball dropped into the cannon and then fired at 1 PM. I went to Fremantle City's oldest gaol to satisfy my curiosity. The gaol is located on Arthur Head near the beach of Bathers Bay. 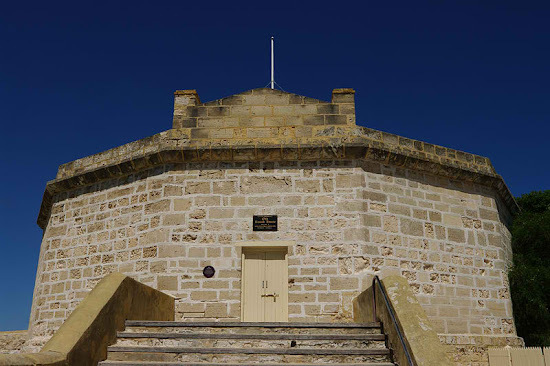 Australians named the gaol as Round House but actually it is in a shape of a regular dodecagon. It was built in 1831 and designed by Henry William Reveley, who is the Swan Colony's civil engineer during that time. The image above shows a pillory, which is used to publicly humiliate law offenders. Pillory has three holes for the head and two arms. Passers-by were encouraged to pelt those who were pilloried with stones, mud, garbage, etc. Fremantle City's Round House has a wide courtyard that has a well in the middle. Visitors of Round House looking down the well. Located beneath the Round House is a tunnel that gives visitors access to the beach. The tunnel was excavated on 1837 by the Fremantle Whaling Company. The tunnel made it easy for whalers to transport whale, oil and other merchandise from Bathers Bay to Fremantle. This is not just a simple tunnel because there are interesting things displayed in the cells that line up its walls. The best “display” can be seen once you reached the other opening of the tunnel. The best “display” is Bathers Bay. The beach is the best place to see the other side of Fremantle City's Round House. Did you notice the black ball hanging from the pole beside the flags? That ball is the so-called “time ball”. Before the advent of modern clocks, navigators has to make do with chronometers for determining their longitude during sea voyage. In early centuries, ships that will undertake long voyages gather at Bathers Bay to await the dropping of the time ball. Navigators will correct the time in their chronometers to 1 PM once they saw the time ball being dropped. The dropping of the time ball is accompanied by a shot from a cannon. Cannon of Fremantle City's Round House. The use of time ball was superseded by radio signals in 1937. The dropping of time ball was re-activated by volunteers in 1998 for the sake Fremantle City's heritage. The location of the cannon is the best place to view Bathers Bay. Best view of Bathers Bay from the Round House. The view activated my imaginative mind. I imagined an armada of pirate ships making their way to the beach below the Round House. Then, I heard cannons firing, British soldiers (in their Victorian Era uniforms) frantically running to the gaol for cannonballs and their officers shouting orders. Too bad that it is just an imagination. What I only saw from my vantage point is the calm sea. Visit Ahab Reviews and Tips and read about Jollibee Party Package brochures. Visit Fremantle Round House website to see other photos of the historical gaol. We are on the same grain my friend. I love our old churches than forts. But forts have beauty of their own, especially for people like me who are interested with history. Ah! Intramuros is much better because it is a city within the walls. Fremantle's Round House is smaller than Fort San Pedro. I thought of Corregidor naman may tunnel din kasi at mga cannons. Isalang ang cannon sa Round House. Masimpressive pa rin ang Corregidor kumpara dito. Aren't you familiar with the Time Square Ball in New York? The time ball in the Round House and the Time Square Ball have similar purpose.